day six; arches national park and island in the sky district of canyonlands national park. waking at the crack of dawn we hit the road under a star filled utah sky. racing our way through the empty roads of arches national park trying to beat the sunrise. we pull into a near empty parking lot as the first rays of the day begin to illuminate the bright orange sandstone; beautiful in any light, but especially so in the golden morning shine. grab our packs. quickly look at a trail map. go go go, up the rocky plateau after a mile and a half the view opens up and below us lay an amazing labyrinth of smooth sandstone curves and monolithic arches. in the distance we spot what we were looking for, the delicate arch. we head towards the famous landmark and are quickly able to take some photographs and talk with the three other people who made the early morning trek, we all sat in morning glow admiring what the elements had created. by time we were heading from our first stop to explore the rest of the park there were hoards of people coming up the trail from a now full parking lot, a few even questioned to us "how much further" and "how close are we" less than one hundred feet from where they had started. 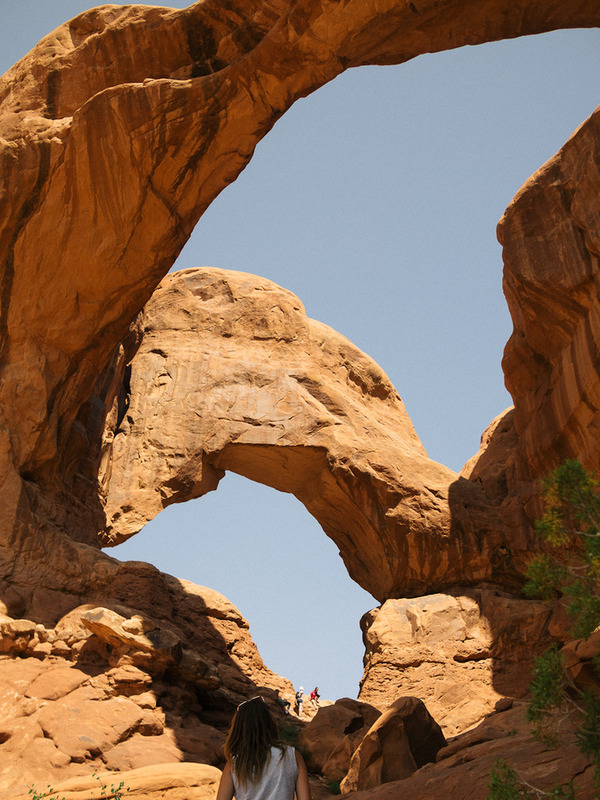 with the mid day sun beating down on us we head to the second entrance of canyonlands national park, the island in the sky district. 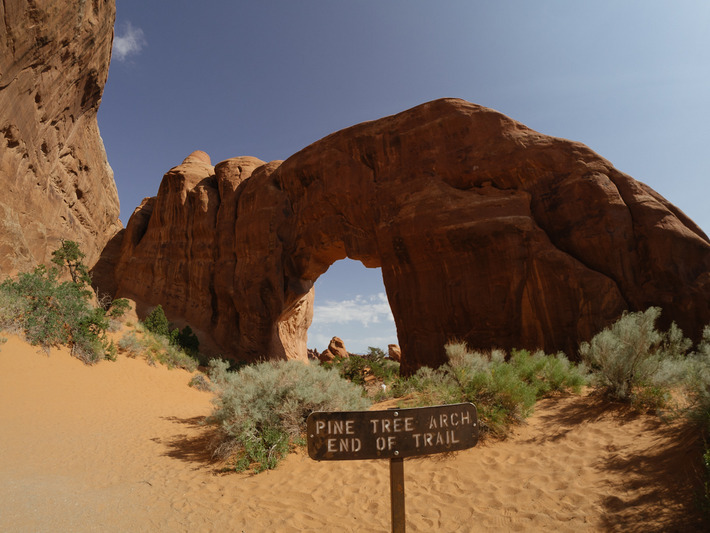 while this park is filled with breathtaking arches, domes and overlooks, we were on a mission to find what they call the "false kiva". a kiva is a subterranean stone circle used by ancient puebloans for religious rituals. our destination is called the false kiva as it is not underground, but instead tucked in a cave within the canyon wall. 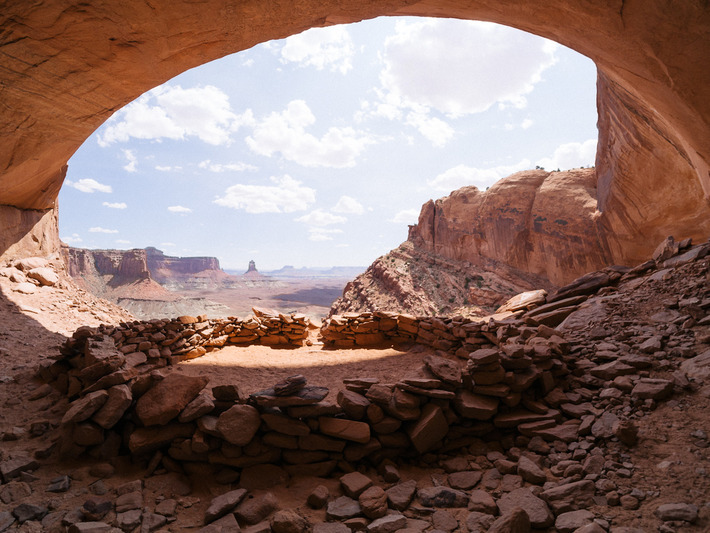 the false kiva is not located on the park map and there are no signs or plaques indicating where or what it is, but if you know about it and ask a park ranger they are obliged to give you pointers on how to find it. we started on our way by hopping over a wooden barrier and began to follow the lightly beaten path down into the canyon. while parts of the trail had been blazed much of the second half was rambling over loose boulders and rocks, the only indication that we were headed in the right direction were the cairns placed along the way by explorers past. as we approached the wall i knew we were getting closer, but i still couldn't believe that someone had found this place years ago. as you look up from the canyon floor it is nearly impossible to tell that there is a cave above you, let alone the stone structure that we were seeking. we basked in the solitude of our find. spending a considerable amount of time taking in the sweeping view of the canyon below perfectly framed by the cave we were sitting in. reading the register inside the false kiva it is obvious that many have been here before, but we still had this feeling of discovery. 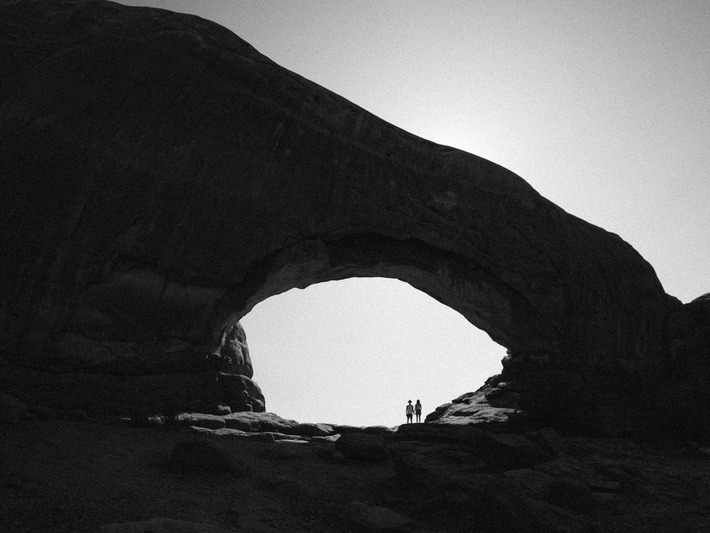 within a national park that sees half a million visitors a year, we were alone.